There are some really cute characters in the Mass Effect series. Liara has charmed many a Shepard with her smile, as has Garrus with his. But there's cute, and then there's adorable. 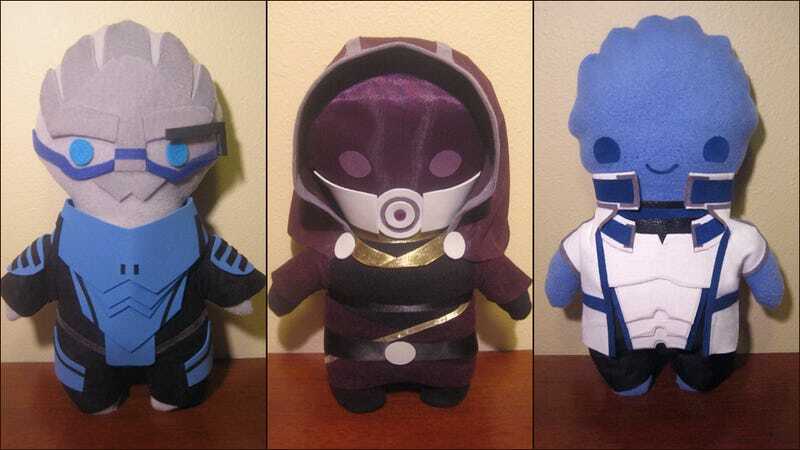 Like these handmade Mass Effect plushie characters. They aren't for sale, sadly, because they simply take too much time to make. But one patient crafter has made herself a veritable cuddly, squeezable rogue's gallery of Shepard's friends, allies, and even antagonists. Urnot Wrex has never looked quite so squeezable, to say nothing of fuzzy, adorable Grunt. Even the disapproving and sardonic Aria T'Loak looks like she'd be fun to hug. To see a handful of other favorites from ME2 and ME3, check out the artist's gallery.